Is it Really Substance They Want? 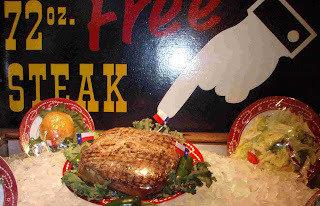 The 72 Ounce Steak at the Big Texan in Amarillo, TX. The perfect example that more is not always better. Of course, if you can eat it with a shrimp cocktail, salad, baked potato and roll in under 60-minutes, its free. I recently had a client give me feedback after a program that said they wanted more substance after a lunch keynote I did. I replied and said I totally agree with how she is feeling and with how the program was structured. As a person with not a mild case of OCD, I wish we could cover every single angle of a concept, every action needed, and every single acre of space for each of the points delivered in a keynote. My question though is whether substance is really what they wanted? (Read: substance as in more, not substance as in valuable.) If substance is the end goal, then a speech is not the way to deliver that. Just have someone stop by the local Barnes and Noble, buy every book on leadership (or cooking or mouse-trap building or whatever), bring those books to the luncheon and have everyone read while they eat. I believe what they really want is action taken by the audience after the program. And action is not a by-product of more substance. Of course the presenter has to cover important, meaning, and relevant information, but not a great big load of it. 1. Provide evidence that the content is relevant to the audience's life (goals, challenges, authentic make-up, etc.) If I am going to be able to take action, I have to first answer the question "why?" 2. Give a handful of relevant, interesting and visual/concrete points. Remember, more information does not equal more value. There is a certain point (and it is different for everyone) where more information given actually results in less information retained. A famous trial lawyer was quoted as saying, "If I give 10 great reasons to the jury why they should vote for my guy, I might as well give them none." 3. Allow the audience to interact with the content, the presenter, the people beside them, and a piece of paper. This gives the information a fighting chance to be remembered and acted upon. It is a fact that if you want to remember something, you need to say it, read it, hear it, hear yourself saying it (out loud or in your mind), and talk about it with someone else. One of the biggest enemies of rookie presenters who don't know which piece of content is worth going in or not AND veteran presenters who thinks everything they know about a topic carries equal weight is giving too much information.